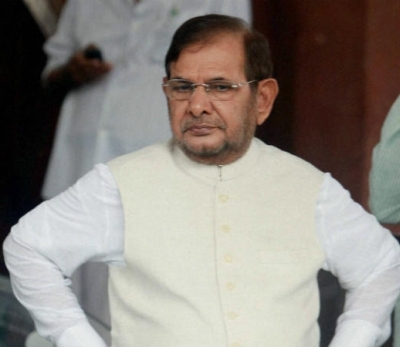 Refuting his close aide Vijay Verma's statement, senior Janata Dal-United leader Sharad Yadav on Thursday said that he wasn't thinking of forming a new party. "Vijay Verma is my old companion. Whatever he said, he said it out of emotions. There is no question of forming a new party," Yadav said. On Wednesday, Verma said that Yadav, who is unhappy with Bihar Chief Minister Nitish Kumar's sudden desertion of the Grand Alliance, may form a new party. Meanwhile, Rashtriya Janata Dal leaders met Sharad Yadav at his residence on Thursday. RJD spokesperson Manoj Jha said they met the senior JD-U leader to discuss problems related with farmers, labourers and the 'disappointed' common man. Nitish Kumar ended the coalition government with the RJD and Congress on July 26 by resigning as the Bihar chief minister. However, he formed the government with the Bharatiya Janata Party.